*Not a commonly stocked item and may require a longer lead time. Please contact before ordering. Standard Power Feeder Stand used for most 1/2HP power feeders including the Co-Matic AF308 Junior Feeder and AF408. 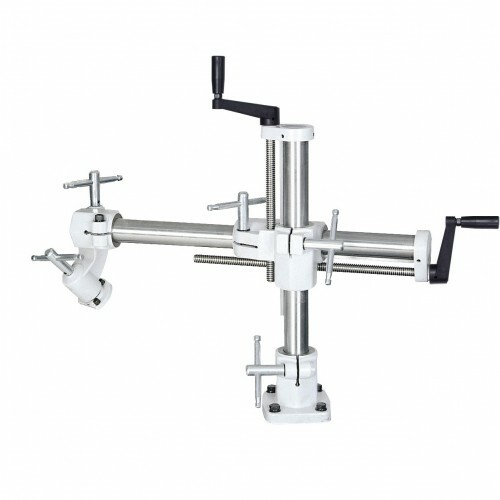 Mounts onto a variety of machinery such as shapers, table saws, and many others. The US02 power feeder stand features sturdy cast-iron vertical and horizontal support columns and universal joints that feature a “T” or “L” locking mechanisms for securing feeders into horizontal, vertical or angled-feeding positions.